It’s inevitably that your HP computer gets slow over a period of time for all kinds of reasons such as malwares, virus attack, excessive junk files. To boost slow HP laptop the best, Tenorshare Windows Care Genius can do a lot. It is a comprehensive Windows system optimizer providing up to 22 features to fix various common problems and make your computer run the best. Before you start to optimize your slow HP laptop to the best performance, you are supposed to click Download button below to download and install program on your computer. Then do as following the instruction. Windows Care Genius with user-friendly design offers the easiest and the most complete features to help different users. So whatever you are a computer guru or apprentice, it will be your best helper. This way will be the easiest way to improve your slow HP laptop performance. Step1. 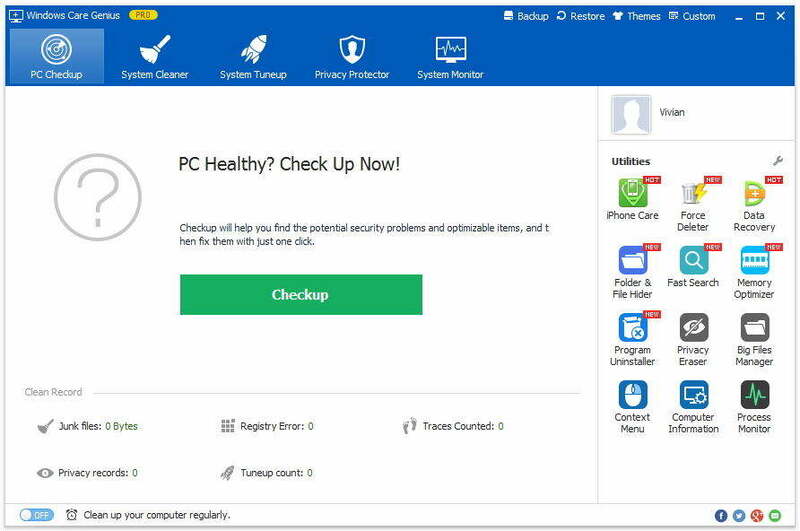 Run the program and click Checkup to analysis the health status of your computer. It takes a few minutes and your computer will be scanned automatically. Step2. After that, PC health index will be displayed as specific grade ranging from 10 - 0. You can clearly know your computer’s situation now. Then you are allowed to click Fix to repair various issues that may slow down your computer with one click. Step3. You are recommended to regularly cleanup your computer and improve its performance. Switch on Clean up your computer regularly on the bottom of interface and set Time, Day and Run Types. Your computer will be speeded automatically without doing anything. Except from basic cleanup, you are allowed to remove invalid registry entries, system junks files, useless files, download history and so forth from your computer to boost. With Windows Care Genius, all the steps can be finished within one click. Next, I will take one of features for example. Step1. After finish fixing, you can navigate to System Cleaner and click Registry Cleaner on the left. Step2. Your computer will be detected automatically and process takes a while. All registries will be displayed and you can click Clean to delete all. Additionally, you can also optimize HP PC overall stability and performance by shutting down startup programs with System Tuneup. If you have any question, you are welcomed to leave it under the comment section.